More seconds!! AND a WINNER!! Young Lou ran a super race at Warwick giving our new conditional Cathal Courtney his first ride under rules. She travelled really well all through the race and looked to be the winner three out when one fell in front of her and brought her to a complete standstill. Cathal did well to keep the partnership together, but you would have to think that it cost them the race and they finished a good second – the rest nowhere! Good effort from a young jockey who could just be a future star, and poor Lou So deserves to get her head in front. One of our biggest supporters and possibly the most patient man on the planet with his horses Mr Beech owns Young Lou who he bred, and also bred Blackcountry Boy out of Simple Glory who also won for us. BCB has taken some time to grow into his considerable frame, and he made his debut on Sunday at Southwell. He made a super start to his career by finishing a flying second, and looks to be a very exciting prospect. Hoping to add to Mr Beech’s winners tally very soon! Some Finish put a stop to the seconds yesterday at Leicester when following up his previous course & distance win with an emphatic victory under a great ride from Charlie. He made all, jumped and travelled well and galloped he rest of the runners into submission! Delighted with him and delighted for his supporters who were out in force yesterday! Unbelievably I still have shares in Some Finish for sale – he is a half brother to State of Play – so why not take the plunge and get involved in a fun horse who is now a dual winner?? Give us a call to find out about our very affordable partnerships. Open Morning this Saturday so the perfect opportunity to come and see Some Finish and his mates. Do come along and see what we get up to on a busy Saturday morning and meet the horses and team. No entry fee – just turn up! Very frustrating day at Towcester on Wednesday with two excellent runs from two very gusty and brave fillies But with TWO seconds!! We all hate second (which is better than third but more frustrating!!) but also feel that we should also be pretty damn chuffed with both Young Lou & Timons Tara yesterday who both ran really good races to be second. Both jumped exceptionally well and were just unlucky to come up against ‘one’ on the day! Both horses also won the BTO for Megan & Hollie – although you could not tell one end from the other when they came back in the conditions were so bad! Towcester excelling itself in the canteen dept again – the girls reporting that the service still dire and the food worse. Topped off with the manager refusing to speak to me although then eventually saw sense! Great PR! Come on Towcester do something about it. On to Leicester yesterday with Some Finish, who we bought after one of the Cheltenham sales last year. SF is by the prolific Kayf Tara and its taken a little while for the penny to drop with him. He actually ran a really good race last time in horrific ground at Uttoxeter and we were quietly confident that the slightly shortened trip would help him. He jumped much better (has had a tendency to jump right) but looked booked for third at the last, which we would all have been chuffed with – however about eight strides after he landed and was still running on – the win suddenly looked attainable! Produced down the rail under a strong drive from Charlie, SF got his head in front and then ran away from the others to WIN by an easy six lengths. I think the collective screaming from supporters at the track and from various other locations around the country must have been what got him home! Still a few shares left in Some Finish who has now proved himself and will be better again over a full three miles – has to be good value so why not get involved with a friendly partnership and a really nice horse? Brilliant for the partnership and great for the team here after three seconds in a row! Its such a relief to get a couple of winners in as its been such a frustrating season for the team. The horses on the whole not running too badly but its no fun being in the placed position when all we want is winners! You certainly find out who your friends are at times like this and a huge thanks to all our owners & supporters who have ‘kept the faith’ – hopefully plenty of reward to come their way from now on. No runners till next week now – off to stimulate the brain at a ‘Backs, Balance & Biomechanics’ conference tomorrow which should be interesting as long as I can stay awake! After a long drought it was great to get back in the winners enclosure at Ludlow on Wednesday. The horses have on the whole been running well, with plenty of placed efforts but with the win being very elusive! Happily Timons Tara, who was third on her previous outing, put in a solid effort to win under Jack Quinlan for owner Mark James in the 2m5f mare’s hurdle. Annoyingly we had a protracted battle against an EPDS horse, and whilst we always want to win it never feels very PC to beat your other owners – even if the horse was trained elsewhere! Sorry John! TT was game as a pebble and fought hard whilst giving the second horse over a stone in weight – once in command after the last she stayed on really well and a step up to three miles won’t inconvenience her! Ground was terrible – it’s worse now that it’s drying out as its gone sticky rather than sloppy and its very hard work for everyone! Kaddys Dream & Must Meet MrsGrath both ran in the bumper at Doncaster, and whilst the ground there the previous day was OK for Under The Phone who ran his usual solid race to be fifth (needs further now) and mixture of rain & snow meant the ground was pretty atrocious by the end of the day and both fillies struggled to get home in the conditions – both will be better on good ground. A few changes at Dickin HQ as Kelly has gone off to work in an office! She has been doing an accounts course for a while now and whilst it was not a great time to change direction we wish her well in her new job, and look forward to seeing her dressed up in her smart office gear! Holly has taken over Kelly’s position at Hill Farm, and Harriet Turner is now in charge of all of the racing tack. We have a great team here, and they have been brilliant even though the winners have been eluding us, it’s a great testament to them that they are all working away even when the going is tough. So a big thanks to them all. A lovely Sunday lunch last w/e with Andrew & Jane Nicholls, a thoroughly enjoyable day and nice to catch up with some old friends and meet some new faces, as well as enjoy a delicious lunch! Open Morning tomorrow – do come along and meet the team, but bring waterproofs as the forecast does not look very promising! Not a great deal to report this week – its still bloody raining – although we did have a bit of a change in type of precipitation this morning with some of the white stuff falling at six am! Yuck. Very slippery on the drive so the scenic route to the gallop today. Its gone now but relatively very cold compared to what we have had recently! No point in running many of the horses on this ground as it simply wastes a run – if they don’t handle it they just have a hard time for nothing and of course recovery takes longer if they are ‘bottomed’ in it. On the plus side we will be very busy once we get some decent ground back and those that have been coping with the ground have been running well. Anti Cool had some form on heavy from his pointing days so running him not a silly option – unfortunately he burst a blood vessel – the ground probably a contributing factor – so another that will have to sit tight for some better conditions. Happily he was fine after the race and will be ready to go as soon as the word good appears somewhere in the going report! The Kayf Taras seem to love the wet going so at least we will have some runners in the next week or so! Nice to see Jane Nicholls here last week who came to see Myroundorurs along with Martin Lynch who was over from Ireland for a couple of days. Another Irishman here to ride out in the form of Connor Smith who is conditional for Philip Hobbs. Jack Quinlan also here to ride out last week along with Charlie, Chris Ward & James Martin. Good to see James ride a winner at Towcester for his Dad Andy – well done James. Well done also to Harriet who passed her HGV test this week at the first attempt! She can now drive anything except an articulated lorry – scarey stuff!! Firstly, Thank you for all of your Christmas greetings, cards and donations to the lads & girls Christmas fund – they drank a good deal of it in the Huff Cap just before Christmas and there were a few headaches evident the day after! The tree is down, the needles hoovered up, and the New Year has come in with a glug! They say it never rains but it pours – and currently we seem to be under a continuous deluge! Ground conditions horrendous everywhere, and the horses not really loving any of it. We have even stopped turning out for a few days as the whole place is like a bog, and after a quick wallow the horses are standing at the gate waiting to get back in! Plenty of runners over the Christmas period and some good results – plenty of places, but frustratingly no winner. Tara Well ran a blinder in the bumper (BTO for Harriet Turner) at Uttoxeter, to be second behind a hot pot of Hobbs’ – the race run in a monsoon like storm – she beat the third horse 17 lengths and skipped through the mud very easily. 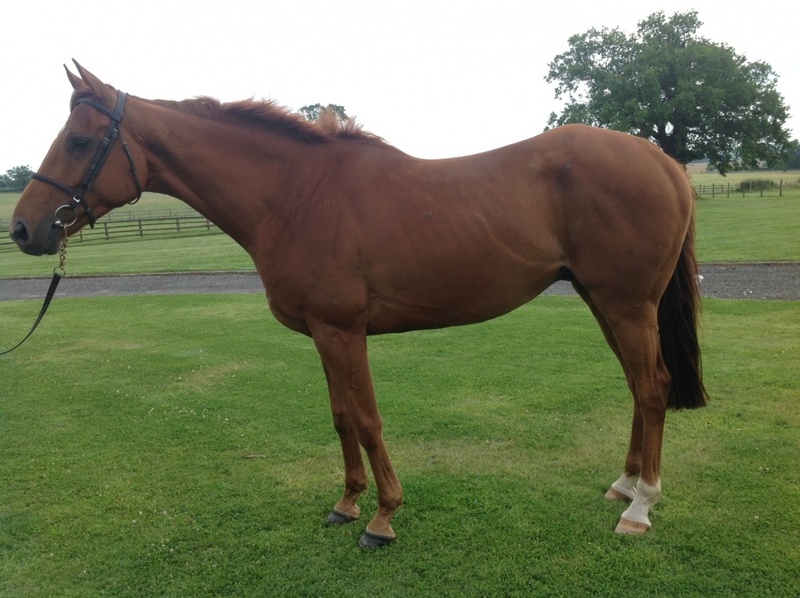 She will be a real fun horse for someone, and is schooled and ready to run over hurdles – and is FOR SALE to stay in the yard and if sold before she runs next will incur no training fees until she wins! What an offer – do call for further details. Timons Tara also ran very well the same day to be third – jumped and travelled really well – just could not quicken in the ground but only beaten a few lengths. Holly and Harriet T doing sterling work in horrendous conditions. Three at Warwick the same day – Young Lou running very well after a long lay off to be third – she fluffed her lines a bit at both of the last two hurdles or would have given the winner a run for his money! Myroundorurs and Kaddys Girl both hated the ground and will do well once we get something less like a swamp to run on. Thomas Crapper ran much better at Cheltenham in a very hot race – again on very unsuitable ground for him, Wildmore Boy behaved himself well which was a huge step forward after the end of last season when he was losing he plot at the races badly! He is another who will appreciate better ground. Garrahalish went to Sandown on Saturday expecting soft, good to soft in places and was greeted with heavy soft in places! The day was a wash out and Gary ran well to be fourth – not sure there can be much track left as most of it was stuck to the horses and jockeys as they came in! Three and a half hours to get home in more rain made for a very long day! Not too much action this week unless the ground has a quick turn around. Anti Cool has entries at Huntingdon & Doncaster. A very belated entry to the blog - entirely due to the pressures of a last minute Christmas! We only have 364 days to get ready for it each year, but every year its a last minute rush! The cards that were written are still sitting on my desk - early for next year?? Apologies for lack of Christmas greetings but we hope that you all had an amazing Christmas and Santa brought everything you wanted. I am just hoping he brings some winners and soon! I will get in quick with wishing everyone a Happy, and most importantly a Healthy New Year! A huge thank you to everyone who has supported us this year - when the going gets tough you certainly find out who your friends are. An attack of placeditis upon us at the moment – an improvement on unplaceditis but mighty frustrating! The horses at last seem to be finding their form and pleased to see Garrahalish run a big race at Ascot – annoying to come up against a well handicapped one of Venetia’s but glad to put a poor run at Chepstow behind him. He jumped really well and made most until turning in, got outpaced but then fought back really well to finish second. Bally Lagan has just returned from a long lay off due to an injury so really pleased to see him running so well. First run back at Leicester saw him only beaten four lengths by the winner, he then followed that run up with a frustrating, but good second two weeks later at the same track. Myroundorurs ran a really good race to be fifth at Warwick – he still need to learn to settle in the early part of a race – Charlie’s arms definitely looking longer when he got back – but huge improvement all the same. Another who has improved a lot is Jackfield who has finished third on his last two runs. Timons Tara is learning how to behave in the preliminaries now which is helping her cause no end! Some Finish has run twice and needs one more for his handicap mark. He is a lovely chaser in the making and still a few shares available. Get Involved finally back to the track after a slightly rock preparation and running really well until getting a bit tired up the straight. The Lion Man hated the ground at Ludlow and will wait for something better now. A new filly arrived from Ireland a couple of weeks ago and has settled in well – Mustmeet MrsGrath will run for the EPDS partnership – she is only small but jumps really well, and hopefully will be some fun. Under The Phone ran his usual good race to finish fourth at Leicester – Charlie and he did well to keep the partnership together after making an absolute hash of a fence down the back straight which cost many lengths and he certainly would have finished a whole lot closer without the error. One who would certainly have finished very close without getting mugged was Garrahalish (BTO for Harriet Turner) who was running a blinder at Cheltenham when getting virtually brought down by a faller at the top of the hill. A faller either side of Gary - who had not put a foot wrong anywhere – caused some nifty foot work by Gary to avoid the fallers which resulted in Charlie Deutsch falling off, and an outbreak of appalling language from Gary’s camp! Gary has run at Cheltenham four times and on three occasions has been so badly hampered that he has lost his jockey – he himself has never made an error – Not sure what he/we have done to upset the Cheltenham gods but they certainly are not on our side as far as he is concerned! Thank goodness he was fine and jumped the remaining fences and quickened up up the run in nicely to finish fourth with his ears pricked! He really does deserve a change of luck. Kaddys Girl (BTO for Kelly) ran a nice race at Ludlow on her second run over hurdles, and Kaddys Dream made a nice debut in the bumper on the same card. Another open day came and went at the beginning of the month a saw some more hardened NH fans turn out in a howling gale to see the horses – lovely to meet some new faces, and hope they enjoyed the morning despite the windy conditions. Thanks again to Terry & Many Poulson and the Venvell team for all their help and cooking skills – also to Holly’s Nan for mince pies and lemon drizzle!! Next open morning is Jan 2nd which may or may not be a good plan after the NY celebrations – a good opportunity to blow the hangover cobwebs away! Do come and join us – or email for an alternative day if you can’t make that one. A few having a midseason break as the ground is so soft at present. Kitegen & Spurned Girl both hate the heavy so will have a short break now, Kayf Tiger has gone home for some pampering from Nat Jameson, as has Storming Harry to get the same from Nigel & Jenny Thick. Next week not busy with runners and so really must get some Christmas shopping done before the big day arrives! Plenty of runners over the last few days, and another Open Morning. Runners first, and plenty of positivity from what we have run – several places but the number one spot proving elusive at present which is frustrating! Warwick saw Vocaliser make his hurdles debut – he pulled like an idiot for the first mile – but jumped beautifully – cruised to the leaders but blew up two out as a result of his early tanking. He is a stunning horse and showed enough to get us all excited. I believe there are a few shares left so do get involved. Tara Well ran in the bumper and ran a blinder to finish sixth only beaten ten lengths by the winner. She is a tenacious little character, and tough as you like. Schools really well and will now go hurdling. She will be lots of fun, and if you are looking for a fun horse you could do a lot worse than her! She is for sale. Towcester last Thursday and a typical Towcester wet one! Myroundorurs back from a break and a wind op – very strong for a circuit, but jumped well and made up ground strongly to the third last – then his long break just caught up with him up the steep Towcester hill. Delighted with the run though – he is schooling well over fences as well so lots to look forward to. Kayf Tiger jumped much better and the penny stating to drop. The Lion Man jumped two – slipped really badly on the turn away from the stands – nearly fell on the flat and that was game over, Charlie jumped a few more fences to get his confidence then pulled up. Kaddys Girl hated the ground, but travelled well for a long way until hitting the hill. She will be fine another day on better ground. The girls excelling themselves with BTOs – they won four with runners in only three races! The judges could not split the two of that ran in the same race so gave it to them both! Well done Holly Kelly & Cerys! The Towcester canteen still dire – slow service, cold food – watch this space for improvements! Ludlow with Under the Phone who ran a good race to be fourth, jumped really well. Timons Tara behaved much better and ran Ok; Jackfield ran a hugely improved race to be third under a good ride from Hannah Watson. Very wet at Ludlow and a BTO for Holly with UTP. Open morning dawned in a monsoon! Having said to the team not to worry as no one would turn up in a torrent we were amazed that about 25 hardy souls braved the weather to come and see the action! Terry & Mandy Poulson here again to help make drinks and Terry also supplying some very professional looking cakes! Thank also to Holly’s Nan as she also provided some equally yummy cakes as did Julie Vennvell. Do hope everyone enjoyed their morning despite the downpour! Thanks for coming! We have raised £100 for the Air Ambulance from the two mornings so far – a great cause. The next one is on December 5th – do tell your friends and come along and see us. What better Christmas present than a share in a racehorse! Our next OPEN MORNING is this Saturday coming, so do tell your friends and come along and meet the team here at Alne Park. The gates are open from 9 – 11. Entrance is free – we are hoping to raise some money for the air ambulance from donations if possible. The horses will be exercising at 9.30 and tea, coffee and a few fattening goodies will be available! Just hope it’s not as foggy as today! Not much to be seen up here today, in fact I think the team are having trouble seeing their horses’ ears the fog is so thick! A busy time since the last blog, but not too many runners. Thomas Crapper ran rather under par at Cheltenham, but a combination of being hampered by a faller, no real gallop, top weight and a post race blood that could be a lot better explains a lot! Desroaches ran poorly at Stratford, but came back with a horrible over reach, which was bad enough to have stopped her and Spurned Girl ran a solid race at Uttoxeter to be sixth – she jumped really well and is coping much better with all the preliminaries now, although Kelly still looked pretty warm when she let her go to post! A couple of the new partnership The Songsters called in to meet their boy before Cheltenham. Jenny Fitzgerald and Rhona O’Connell hopefully enjoyed their visit – I was sad to miss them as I was in Somerset with Harriet at the last event of the season. Tilt Du Chatelier who was very moderate as a racehorse, had a change of career when Harriet took him over to find him an alternative career. The pair have had an amazing season going from BE90 to CIC1* in twelve months. His first international was a credit to them both finishing 12th out of 100 starters – a fun weekend, and proud of them both. Great for a horse that was so difficult in training to take to another discipline so well. A great advert for the retraining of racehorses. More visitors from C&D Tours last week, with Stephen Toms here on Friday and three members of Marshall family here on Saturday – hope they all enjoyed their visits! Stephen having a less good weather morning on Friday when along with Terry & Mandy Poulson chose the wettest day of the week to come over! Annoyingly The Lion Man was balloted out of Ascot on Saturday, a race which we had had in mind for a long while! Entries at Warwick and Towcester this week. We held our first open morning at the beginning of the month – and it seemed to go well. Rather remiss on my part as I found myself double booked and so Mandy & Terry Poulson and Julie Venvell kindly came to hold the fort! We had a nice turnout and hopefully everyone enjoyed the morning. The open mornings are set up so that anyone who is interested can come and see the horses work and see what goes on at Alne Park! Although we have a very open house visitors policy, not everyone likes to ask about coming, so we thought it was a way of overcoming that. We raised some funds for the air ambulance which is such a great cause, and will be holding our next one on the first Saturday in November. There is no entry fee so if you would like to come along do feel free, email or call if you would like more information. My double booking was with Harriet at Osberton horse trials where she and her horse Dargle Looks, aka Bean did the CCI2* - big and scary, they both made light work of it to finish 26th out of 120 starters which included plenty of our top riders. Getting near the end of eventing for the year now and it will be nice to have a few Sundays at home. The horses on the whole running well without getting into that number one spot. Kitegen was fourth at Fontwell, he made an uncharacteristic howler at the second last otherwise would have been a lot closer – but a good run and not beaten far. Twycross Warrior made his racecourse debut and did not really get his breathing right - tried to do it all in one breath and then unsurprisingly did not get home! A busy day at Towcester – nice to be back there, but oh dear they do need to get their act together re looking after our staff. The canteen food is dire and usually freezing cold – and no offence but I don’t think the staff in there have a clue! The track has been ruined by the addition of the dog track, but the plus was that they had made great efforts with the ground which looked lush and green and rode well. It seems that the management have lost some direction, although the Robert Bellamy and the raceday team (canteen excepted) are doing a great job. The horses ran OK, Jackfield running a big race till two out then got tired and needed the run, as did Spurned Girl. Tara Well ran well in the bumper, but needs the ground softer and also wants further – she will be a fun horse and Charlie was very pleased with her. Thomas Crapper surrounded by a lot of hype from the press was never a foregone conclusion in a hot novice chase and finished third. He ran well, jumped soundly but was just done for toe by two very decent rivals. 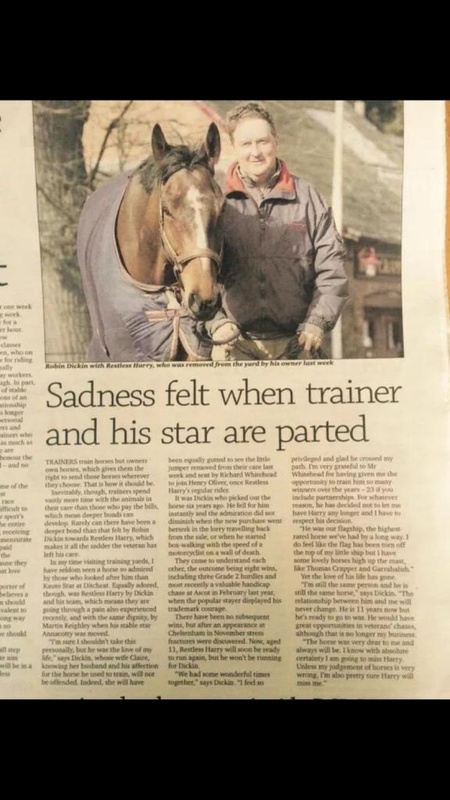 Saddened by an abusive phone call from someone who had clearly lost their cash – apparently many trainers get this treatment when they have a beaten favourite – pathetic really when someone can call a trainer foul names but is too scared to say who they are. ‘Get a life’ is the phrase that springs to mind! Holly was robbed of the turnout with TC, think the judge was looking at the wrong horse, but Kelly and Harriet T both won it with Spurned Girl & Tara Well. Garrahalish ran a terrible race at Chepstow, but came back with a dirty scope, Kayf Tiger ran well to finish fifth. He is still learning his trade and needs to relax more so that he can get himself into a better rhythm. Sorry not to see Vicky Jameson at the races – she is on box rest at the moment so best wishes to her for a speedy recovery. The Lion Man ran a super race to finish third at Uttoxeter (BTO for Holly) – good to see the Coopers there who along with Mark their friendly driver had a nice day. Spurned Girl ran OK at Stratford and Under The Phone made a solid chasing debut at Kempton in a furiously run race – Charlie said that he had never been so fast over fences! UTP jumped soundly and was unlucky that there was no grief in front of him as the first two home looked extremely hairy - I know which one I would rather have been on! Lots of visitors recently including Mr & Mrs Essex who came on Saturday morning and were our first visitors courtesy of C& D Stable tours. They did come into something of a manic morning so hope they enjoyed it! Charlie, James Martin, Chris Ward, Connor Smith & Tom O’Brian all in to ride out this week – always a help to have some jockeys in. Many of you will know that the Dickin family have moved house – only a short distance up the drive, but it was still a mission! As we are now in Alne Park house we are able to offer B & B in the form of two beautiful en suite rooms. This is obviously a new venture for us, but it seemed like too good an opportunity to miss to be able to offer this facility in such amazing surroundings. Hopefully this will suit owners who live further afield, and also anyone who is wanting to stay near all that central Warwickshire has to offer – including a morning on the gallops to see the team in action. Nice to get back to the races at last, with two runners at Warwick last Tuesday. Garrahalish back to his old self and running a really solid race to finish third giving weight to both of the first two. He jumped soundly and finished running on. Charlie thought the track was definitely not for him as he found it too sharp but that he felt back to his old self. After two muggings at the end of last season it was a relief to see him enjoying his race and he remains in high regard. No doubt about the trip now - we always thought he would stay for ever but having been brought down at the festival and then sick after his last run we did not have confirmation of that until this run! Be My Witness jumped well but always looked a bit out paced around this track and finished fifth. Not a bad run but she needs to be able to travel better to back up her good jumping. The string looking well and are all not far off a run – the weather may interfere this week though as it set to be warm and dry so no doubt we will all be moaning that the ground is too firm! The new members of the family are thriving – five puppies is a lot to handle for Milly but she is doing them, really well. A couple of new members of staff have joined us this week and we welcome Daniel and Gosha who have come from the Northern Racing College, but hail from Poland. Nice to see Graham & Lyn Knight here last week to see Twycross Warrior who will be making his racecourse debut shortly. Party night here on Saturday when a fund raising ball was held on the lawn to raise funds for the Stratford Cancer & Eye hospital – a great night when around £50k was raised for a great local cause. Judging by the cars left the next morning I would imagine there were a few sore heads the next day – happily a short trip home for us! Our first ‘Open Morning’ this Saturday so do come along if you would like to come and see the action – gates open at 9am, no entry charge – come and enjoy seeing the team in action. A hectic weekend with our Owners Lunch on Sunday. We changed the format slightly this year and instead of having a full on Open Day just had Owners and Friends for lunch and a chat about the horses. Lovely to see so many – about 200 so was pretty cosy, but hope everyone enjoyed the day and the delicious pork cooked by Brian Kerby, and a particular thanks to Julie Venvell who conjured up some amazing puddings for everyone. Not a scrap of them left, so think they were enjoyed! Thanks to the team for all the help and to Stratford Racecourse for the loan of tables and chairs! We are not abandoning the Open Day but changing it slightly in that we are having an Open Morning on the first Saturday of each month. Locals will have heard our advert on Touch FM, so hope anyone that is interested will join us to have a look around the yard and to see the horses working and meet the team. The gates will be open from 9am, there is no entry fee but we will be hoping to raise funds for the Air Ambulance. Do call if you would like further information or drop us an email. We look forward to seeing you. Harriet and Annalisa spent an interesting day at the Stratford Business show last week, I booked a table at the event as I thought it would be a good opportunity to meet up with local businesses, and then realised I was supposed to be on a First Aid refresher course that had already changed five times, so the girls stepped into the breach! I think they had an interesting day and hopefully we can work with some other local businesses to mutual benefit! Kitegen ran a nice race at Newton Abbot last Friday to finish fourth. Slightly frustrating as last time he appeared not to really need 21/2 miles but this time looked as if he needed further than two! His trip is possibly very ground dependent! He has bounced out of the race well and should be out again soon. Two runners today at Warwick. Be My Witness back after a break and back over fences, Garrahlish back from an even longer break, and also into the unknown trip wise. Both seem well at home but the first runners of the season always a bit of a worry until you know just how fit the string are! Fingers crossed for a good day. The other big news this week is the arrivals of Millys’ puppies! Two sleepless nights for her and me resulted in five gorgeous little people, (with sadly one who did not make it). She is being an excellent mummy to four boys & one girl. A very early start yesterday morning with a lorry arriving from Ireland at 4.30am! The newest addition to the team in the shape of a very exciting three year old colt called Vocaliser. A winner for Jim Bolger on the flat as a two and three year old he is for a new partnership called The Songsters. The group is fronted by some existing owners of The Tricksters partnership and there are some shares still available – do give a call if you would like to get involved. Vocaliser will be aimed at juvenile hurdles this time, with the possibility of taking in some flat runs along the way. Another new addition is a super filly – as yet unnamed - by Kadastrof out of Symbiosis who is the dam of a good horse called Kingfisher Creek who is rated 131. The filly is going really well and her owner/breeder is looking to put together a small group to enjoy her racing career. Again do call the office for further details. The gallop refurb finally finished, and some new drains in to help with getting the water away during deluges! A lot of work involved in getting it just right but so vital to keep the facilities in A1 condition, and pleased with the results now. Charlie is as usual and joined by David England, Ben Poste, Chris Ward and James Martin - great to have the extra help – especially at this time of year when the horses are in maximum work. The Venvell family here last weekend to see their horses, and a lovely evening with Nigel and Jenny Thick last Friday to celebrate Storming Harrys’ super win. The Bridge at Bidford becoming a favourite place to eat, and to be recommended! Very happy to report a winner last week – and on the flat too!! Storming Harry has tested the patience of his lovely owners Nigel & Jenny Thick, to the limit! He has been very difficult to train but improved immensely on his previous run to finish a close up 5th at Nottingham. This time it was off to LIngfield – not a pleasant journey from here, and the M25 its usual chaos! SH was held up through the race, and travelled well but then was in all sorts of bother off the last bend, and it looked as though his chance was gone, however once he got some daylight he stayed on gallantly and got up to win by half a length! I think the collective screaming by the team at the races and also the home team must have done the trick! Delighted for Nigel & Jenny who bred SH out of a super mare that we used to train called Miss Pebbles. Always special to do it with a home bred, so huge congratulations to them and also to Rachel who looks after SH and has nursed him through thick and thin! We have had a long spell without a winner so a relief to get off the cold list. 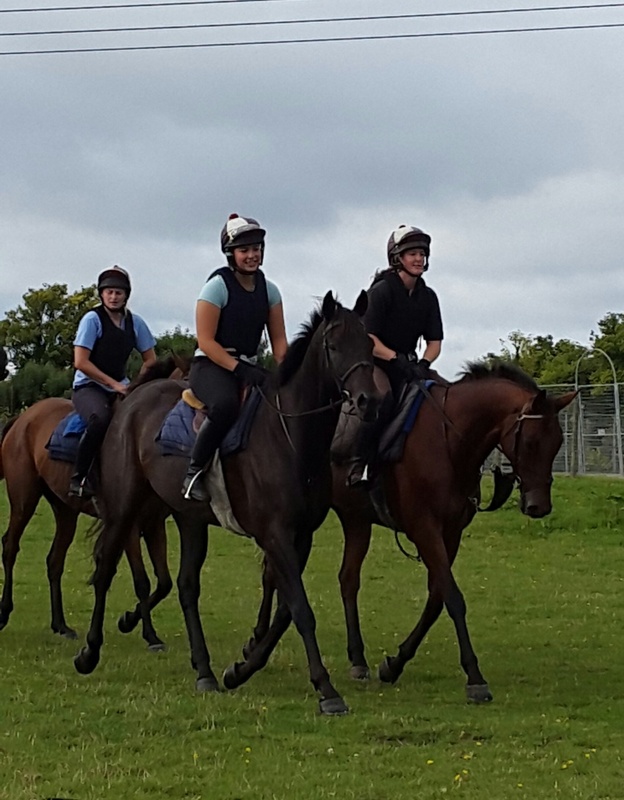 It’s great to have the team all in again now, and what a lovely bunch of horses we have for the season. Very happy to have Kitegen back after a brief spell away, and a big welcome to his owners Paul & Clare, who have shares in other horses too, but having their first venture into joint ownership. We wish them all the very best of luck. The gallop is all but finished now – just waiting on one load to finish it off. The surface riding really well after the top up, although it was nearly a case of dodge the Eddie Stobart lorry after one of the drivers managed to sink a wheel on the side of the gallop! All rather tense for a while as it had a big lean on – thanks to Granville Stevens for the loan of a big tractor to help ours pull it out! Good to see Ben Poste, Chris Ward and James Martin all in to ride last week – a big help as Charlie off on his hols for a while. Harriet also back in harness and a big welcome to Zach Sparrow who joins us as a full time team member. A big young farmer’s party down the road on Friday night and in the aftermath of Storming Harrys’ win the day before a few sore heads in evidence on Saturday morning! Robin & I went to Tattersalls sales last week to look at a horse, which we liked but not really enough to buy it! The search continues for the next star! We were also under bidders on a couple of stores which was mighty frustrating; the trade was pretty solid with as always the nice horses making good money. A busy trip, but well looked after by Tatts who provide an excellent service getting everyone to and from the airport, booking hotels etc! Happily Aer Lingus flights cheaper than the mighty Ryan Air last week – only a short trip but you can certainly tell the difference! Resurfacing the gallop began last week with just over 166 tonnes of new woodchip being laid down on top of the older chips. The job is almost done and with new drainage also being installed the gallop will be in brilliant condition all winter. The arena is also having a refurb, so our already great facilities will be in tip top order! On Friday the 24th Kayf Tiger ran at Uttoxeter in a National Hunt Flat race, he travelled well for much of the race but just got a bit tired in the last couple of furlongs, he will come on for the run. Ideally he ran a fortnight too soon, but without travelling as far as Perth, options were very limited and we were pleased with his performance, particularly as the first 3 home look like being very high class horses. Also well done to Megan for winning yet another best turned out! On the 30th Storming Harry headed to Nottingham to run in a 2 mile flat race, his first time over a longer trip and were pleased with a vastly improved performance. He finished 5th only beaten a short distance. He had some problems after his last run which explained the poor run, acupuncture from Fiona Georgetti has helped him enormously, so thanks to her for all her help. This week we also had Harriet Turner start as a full time member of the team; Harriet has been with us part- time since coming for work experience a year ago and we are pleased to welcome her on board! Zach Sparrow has also joined us this week – so great to have a strong team complete for the season. Good to see Albert and Angela Thompson, Nicky Preece and Julie Venvell here last Saturday to see Some Finish, Get Involved and Bally Lagan who all look well after their summer break. Nearly all the horses now in and its great to see all the heads over doors again, another trip to Ireland this week on a mission to find another star – a busy day with several nice horses to see, and a day of backs as well. Always nice to see the Irish friends and a busy couple of days. We managed to sneak off for a week to see if we could help out the Greek economy in Kefalonia. A lovely week with the family, very relaxing with plenty of sun, nice to be away but equally nice to get home and make a start on the new season. Most of the team also back from their summer breaks refreshed and ready for action. Ceris Biddle joins us as a new team member. She lives locally and has been our super Saturday girl for a couple of years – great to have her full time now. No doubt most people will have seen the article in last weeks RP re Restless Harry leaving us. A big blow for the team, and hard to understand when no reason given by the owner, devastating for Holly who has looked after him so well for so long. Of course we wish Harry all the best, and mostly that he stays safe. We will miss him immensely. However they say that what doesn’t kill you makes you stronger, and it has been amazing how many messages, tweets and phone calls of support we have had, so thank you to everyone who has been so supportive, it means a lot. It’s onwards and upwards from here, and we have a nice team to go to war with. Lots of youngsters who are now handicapped, and some babies who were getting educated over hurdles who are now ready to go chasing. Exciting times, and can’t wait to get going again. Lovely to have Badgers Cove back from Mr Beech’s where he has been having an extended spoiling – he has swapped with Young Lou who has gone home for a break and no doubt the same treatment! Be My Witness finished fourth on her first run over fences yesterday – jumped well and fine today. BMY also turned her hand to flat racing last week, when stepping in at way beyond the eleventh hour as a replacement runner for Chris Dickin in the charity race at Ascot. Chris’s intended mount was unable to run at the very last minute, and so ‘Spice’ was drafted in to make sure Chris’ amazing efforts in preparation for the race (lost 2 stone, endless early mornings to ride out before work and raising an incredible £5.5K!) did not go to waste. As a 94 rated jumper against a load of much higher rated flat horses she was always going to have her work cut out, but gave Chris a great spin to finish fifth. He really enjoyed the experience and thank to everyone who came and supported him on the day. Ascot sales last week and Dance For Livvy, Presenting Paddy and Windy Miller have all gone off to pastures new. We wish their new connections all the best and hope they all do well in the future. A happy lunch last week at the Manor in Moreton in Marsh to celebrate Alan and Anna Varey’s (Batsford Stud) Ruby wedding anniversary. Many congratulations to them and also thanks for a delicious lunch! A sad day for us last week. No clue as to why this has happened, but the article written by Lee Mottershead says it all. so no need to add to it. The placeditis outbreak continues – with a double of seconds at Market Rasen. Both Kitegen and Galactic Power both finishing runner up under Charlie & Joe respectively. Lovely to have Kite back firing again and he was desperately unlucky not to hang on for the win. GP ran his usual game race and again was unlucky to come up against one on the day – he has come home a little sore so crossing everything that we can get him settled down and out for a break. Spurned Girl ran a hugely improved race at Stratford running on really well to finish third under Ben Poste – the tongue strap helping her enormously! Great o see her starting to repay some of the Hitchman families’ patience. She has been a big handful but has settled down well and starting to channel her energies in the right direction now! Young Lou ran well for a long way but needs different tactics, and Be My Witness ran well to be fourth should have been closer but for encountering traffic problems in home straight. The power hose is getting well used at present; it is a big job to get all of the boxes to cleaned right out, washed and disinfected and a very tedious one too! The team are on it though and making good progress, although will be thrilled when it’s all finished! Harriet & I have been in Ireland for a couple of days this week, plenty of backs to do for me and some young sport horses for Harriet to sit on, as well as a catch up with some old friends. An enjoyable trip but energy levels dipping a bit today! No runners over the weekend and indeed pretty quiet at present with only 14 or so in. The rest looking fat and happy in the field. Dancing Daffodil will be looking particularly fat before too long as she has just been scanned in foal to Native Ruler who stands at Batsford Stud. Super excited about this news as we bred her and her mother and I owned her grandmother from a very young age and saw her born! How time flies! An outbreak of placeditis since the last update – an improvement on unplaceditis but still frustrating. Many of the team now shivering out at grass, but still quite a few to run – at least the rain is keeping the ground safe! The Lion Man shaping up nicely, and finishing fourth on both of his starts over hurdles so far – he is growing into a really nice type and getting stronger all the time – he will make a chaser in time but will win over hurdles before too long. Get Involved needs a wind op – no sign of trouble at home but he has been very noisy on both of his last runs – he is an exciting horse and will be back in the autumn. Anti Cool is another that helps you to get out of bed in the morning – he has been third in both his hurdle runs and makes his hurdles debut tonight at Southwell. A hot little race but hopefully he will run well and gain from the experience. Experience was what is needed for Wildmoor Boy, who got horrifically upset on his hurdles debut. He really did not cope with any of the preliminaries at all – very out of character for him – and had run his race before they even jumped off! We ran him again quickly to try and help him cope, which he did and ran much better to be third. Young Lou also third and running a nice race. Kitegen has got his jumping confidence back and is coming down in the handicap and will be back in the winner’s enclosure soon. Galactic Power ran a super race at Worcester to finish a fast finishing third – the race not run at all to suit with a very slow early pace he then got rather done for toe down the back but finished probably best of all. He has been a great little ‘super sub’ standing in for a couple of the EPDS horse who have had to have some time between races and is a lovely character to boot. He is gathering quite a fan base, and is an easy horse to like! Kaddys Girl also ran really well in the bumper at Worcester, she continues the very good line of offspring from Dickies’ Girl – the dam of Arctic Spirit, Autumn Spirit and Bill Brown among plenty of others, and is another that will soon be troubling the judge. The night racing certainly takes its toll on everyone, but good to manage to spend some time with John Powell and Ellie over a very late Chinese after racing and for them to be able to see the string without an early start. Shares in Some Finish going fast now – he is having his summer break now, but it will be good to get the partnership together by the time he comes in so if you are interested do please get in touch. He is another that should be a lot of fun for next season. There are also a few shares left in The Lion Man – again great value for a horse that is showing plenty of promise. On the whole the horses are running well – last season was always going to be a tricky one for us as we build up a new base of horses. Lots of youngsters to get handicapped, many of which are future chasers – lots of b****y seconds (including five for Thomas Crapper!) and Restless Harry off the road – but also now lots to look forward to as we get going on the new season. As always huge thanks to all of our lovely owners and supporters and of course the team at home. The home team now trying to fit in holidays as well as all the usual summer jobs that involve paint brushes and power hoses! It would feel a bit easier if the weather was less Baltic and a bit more like June! 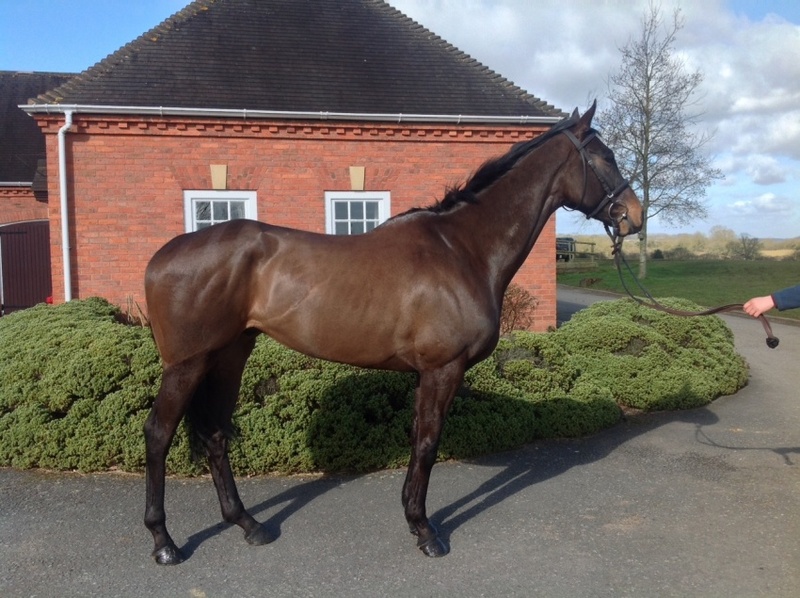 We are putting together a new partnership in this lovely horse and there are a few shares remaining. He is by Kayf Tara out of a three times winning mare and has been second and third in points. He would have been second or third in the previous run too but for tipping up at the last! He is closely related to the prolific winner State of Play and is a lovely stamp of a horse.We have been doing a bit with him at home since he arrived and he has done nothing but please us - seems to have a great temperment and does everything very easily. If you might be interested do come and see him or give us a call (07979518594). We think he will be an exciting prospect for next season. A slightly bumpy ride for us lately with some of the team not running up to expectations, but also explanations for some, and things not quite as black and white as it may look on paper. More of which later as first mention in despatches has to got to Thomas Crapper who is back from his Irish adventure. TC made the long trip to Punchestown with Tom George’s lads as Harriet and I were already there. He arrived in good shape although delayed after a long wait in the docks as it was too rough for them to go on the fast boat. A few early hiccups ironed out very quickly and TC settled well after a bedroom move late at night. Harriet did an excellent job with him and spent a lot of time grazing him in-between exercise as obviously he could not be turned out – he looked amazing and handled the buzz well. The whole place was electric and it was amazing to be part of it all. Sadly the dream did not come true, and TC ran a little below par to finish 7th. He jumped well and was far from disgraced – he so game and genuine and a horse that we are all privileged to have anything to do with. Great that many of the Crappers made it over to Punchestown, and also lovely to have support from some of our other partnership members who were there too. A night in Naas with Graham Wilcox and Peter Marsh seemed to leave the trainer with a bit of a headache the next morning! We travelled back on the early boat on Saturday morning, with Harriet’s horses as well the lorry was packed to the roof, the crossing was pretty choppy but not as rough as the drive through North Wales which was horrendous, with monsoon conditions. Back safely though and very happy to get back into my own bed after nine days away! Sleeping in the lorry is all well and good when it’s warm but less appealing in Baltic April weather! It’s not all doom and gloom as we have had some very nice debut runs from Anti Cool and Kaddys Girl who both finished third in their respective bumpers. AC hard done by not to be second as he was badly interfered with in the last furlong, KG a super first run for John and Ann Rogers who have recently bought the sister to the good family of Arctic Spirit, Bill Brown etc. Kitegen ran much better to be fourth at Exeter and third at Chepstow, an improved run from Presenting Paddy at Southwell and a nice come back run from Young Lou after a few months off after a stress fracture. Galactic Power (BTO Kelly) put a poor run at Bangor behind him yesterday to finish a good second at Newton Abbott. Dans Quest a super second at Chepstow – bloody annoying to find one too good on the day but a good run nonetheless. Mertesacker ran a much better race at Wolverhampton. Some not so good runs have been frustrating – both Galactic Power and Dans Quest both ran stinkers at Bangor, no explanation and some odd results on the day apart from ours. Warwick runners had wind issues and Timons Tara (BTO Holly) got herself into a frenzy before her race and left her race in the paddock! Be My Witness travelling really well at Fakenham but then both she and Joe got kicked by a faller – Joe in the arm and BMW in the belly. She was distressed after the race and very sore, so a run to put in the bin for her! Dontminddboys ran well for a long way at Cheltenham but Charlie felt he is still rather weak and did not really see the trip out, and Garrahalish ran OK to be fifth but was not the normal Gary and very flat throughout. He came home and then got a snotty nose so obviously had something brewing that did not show up on bloods or scope. Training horses can be such a roller coaster, and even with all the tests available these days is never an exact science – frustrating when you can’t nail an explanation for some poor form, but often a reason lurking which raises its ugly head after the event. Plenty of holiday time beckoning for some of the horses now and the grass finally getting greener. Very cold up here yet though and not sure it’s quite time for rugs off even if it is May! News a bit thin on the ground lately – super busy and there just does not seem to be time to fit everything in! Various runners making their first appearance for us, including Spicy Lady who ran Ok at Chepstow – first runner for Paul Rogers, and another BTO for Megan. The Lion Man had his first run over hurdles and finished a pleasing fourth, delighted with him and for John & Margaret Cooper who have bought a share in him to replace Dancing Daffodil who has gone off to Batsford Stud this week. We bred Daffodil who won 5 races for us and she was born at Batsford so it felt like we were completing the circle! She has gone to get up close and personal with Native Ruler – a young stallion by Cape Cross. Exciting times! The Lion Man was another of our Irish purchases – had a good first run but then rather disappointed, however Charlie and I loved him so decided to take the chance and he has showing us the promise that we hoped for. Shares available in him so do get in touch. Thomas Crapper (BTO for Harriet) went to Ascot on the windiest day of the year – the journey down the M40 was horrendous! TC is the model of consistency but does prefer good ground, and the deluge in the morning was not in our favour. However all looked well as he jumped for fun and was upsides at the last. We thought we had the winner but Puffin Billy fought hard and just piped us on the line. The race was won on the nod, and one stride before would have been ours. So disappointed for TC who must be the best qualified novice in the country having been second five times this season. It’s easy to go through all the if ands and buts, and at the end of the day he was only beaten about three inches, but the softening ground was against us and for the winner. Take nothing from the winner who also ran a great race – a dead heat would have been a great result! TC will now possibly head for Punchestown. No time to pause for breath and back down the M40 with four on Monday Mertesacker very strong early doors and then did not get home having nearly run away for the first mile. Kitegen running a super race till belting five out – hard – Charlie sensibly pulled him up after his chance was gone. Under the Phone ran his usual solid race to be third, and Timons Tara disappointing when fading after coming there easily and looking sure to be in the shake up. Lots of visitors over the last couple of weeks – great to see everyone and of course everyone always more than welcome. Many of our owners will remember Kykie Allsop who owned horses such as Kadijha and Jose Bove with us – sad to say that she died recently in tragic circumstances. Always an entertaining character Kykie was a very kind person and we send our sympathies to her family. On a happier note we wish everyone a Happy Easter – unlikely any runners over the w/e – one race too hot – ground too soft elsewhere! One omission from the news latest was Get Involved ‘s debut for us at Southwell on Monday. Get Involved is the lovely Milan horse that was bought to replace poor Point of Attack that we so sadly lost back in the New Year. He has been doing everything nicely at home, but we see him as a future chaser so were just hoping for a solid run to start his career over here. Absolutely DELIGHTED with him – he jumped like a pro and stayed on well to finish a very creditable third. He will want fences and a more galloping track, but it was a very good performance. Really pleased for the group who had been so patient with PoA, only to lose him just as he was coming together. Several of the team there to enjoy his run and think that they certainly have an exciting recruit on their hands. Back to reality with a bang on Thursday after Thomas Crapper’s great run on Tuesday. Garrahalish running a super race, (jumping like a stag for John Mathias) was infuriatingly brought down in the Fulke Walwyn chase. Poor Gary really did not deserve it and nor did John who was giving Gary a great ride. Happily both Ok afterwards and live to fight another day, but of course there are always the ‘if only’ thoughts to deal with! It’s the third time Gary has been mugged, and the second at Cheltenham, which is so disappointing for one of the best jumpers that you will see – his luck must change. If a mistake is your own it’s so much easier to deal with, and being brought down/hampered leave you with a real ‘kicked in the guts’ feeling! However, it could all have been a lot worse, as was brought home by Tom Weston’s’ horrible fall in the same race. Cheltenham its usual magic self, amazing atmosphere and we were extremely well looked after in the Brightwells pavilion with a superb lunch, so thank you Cheltenham for that addition to the day, much appreciated by all owners and trainers I am sure. Under the Phone to Kempton on Saturday for the Silver Plate race for horses that were balloted out of the Martin Pipe on Friday. He ran a blinder under Joe P jumped like a bunny – a solid effort. Eventing on Sunday and a win for ex racehorse Tilt Du Chatelier who Harriet has been re training – delighted to see a horse who did not take to racing having another opportunity at a different job, and very proud of Harriet who has turned a very difficult ride around. Lorries in two directions yesterday one heading north, the other south with Routine Procedure and Presenting Paddy – a long way both ways! RP got rather upset in the preliminaries and really ran his race by the time they got to the second hurdle! He stayed on one paced though and jumped very well. Fences beckon! Presenting Paddy has been off the track for a while and managed to get rid of Charlie at the second fence on his return run a couple of weeks ago, when his head was going faster than his legs! Not the case yesterday, when he jumped like a stag, and settled well. He did not really appreciate the dead ground and Charlie pulled him up turning in. All positive though and he also behaved on the lorry with Tommy for company which he certainly did not first run!! All home safe and sound, although the box driver from Exeter was flagging a bit by the time we got home! A long day. But annoyingly met one just too good up the run in. Its hard not to be disappointed with second again this year, but actually just feel immensely proud of our boy who is an absolute star! He seems to love Cheltenham and is not at all fazed by the crowds and general buzz of the place. Back home safely and fine afterwards always the highest priority. Out to play with his friends yesterday and the next step being planned. Back to reality and Huntingdon yesterday with little Galactic Power who has been acting as a courtesy car to EPDS Racing whilst Anti Cool has been off, and now has stepped into Money Maids shoes for EPDS 5. Ridden by Charlie’s girlfriend Francesca Nimmo, GP was suited by the savage early pace he jumped superbly and was always in the right place at the right time. Staying on well down the back he swept to the front turning in and went on to win by 5 lengths. Probably an odd sort of day for John Powell who runs the EPDS partnerships as their other horse was second! He did mention that his only thought going to the last was that he hoped that GP did not fall and bring Celtic Artisan down – not a good thought at all!! Our first winner for John and his team, and a first winner under rules for Fran. Delighted for both, and also for Kelly who has been a GP fan from the minute he walked into the yard and has looked after him since. Off back to battle today with Garrahalish in Fulke Walwyn chase today, was OK till I read the Racing Post – now feeling quite sick! Have just endured a nervous couple of hours watching the numbers go round to see if Thomas Crapper would get into the last race tomorrow - it went to the wire as we were last in, so there are not to many finger nails left! Roger Bravington here to endure the pain with us, and has now gone home to lie down in a darkened room before tomorrow! Obviously a huge ask, but he has every right to be there and seems in great form at home. Nervous does not even begin to describe how we all feel now, but thing that really matters is a safe round. It will be more of the same on Wednesday as Garrahalish will be declared for the Fulke Walwyn Amateur race on Thursday. John Mathias came to have a sit on gorgeous Gary today, (loved him!) and will ride him if we get a run. A little quiet on the runners’ front, heavy ground and a few abandonments playing havoc with plans, but as always plenty going on. Also back to the fray are Storming Harry who has had a frustrating few months with a cut that has taken a long while to heal. He managed to slice open his shin in the field, which then needed all the skill from the team at Three Counties to fix – its looking great now and you would never know how bad it was. Lots of patience from Nigel & Jenny Thick and lots of TLC from the team – especially Kelly & Rachel – it’s lovely to have him back in action. Bally Lagan also back under saddle – he picked up a small injury last summer, and doesn’t handle soft ground so we have taken our time with him – he did have to go into the field before being ridden as otherwise there was a good chance we would find someone hanging in a tree!! He was as good as gold though. And Joe pleased to back with his partner in crime! Anti Cool has also finally made it back into the field – a nervous day – he definitely needed to get the buck out of him, and it’s brilliant to have him back in work. Dance for Livvy ran an improved race at Wolverhampton, Windy Miller ran well at Kempton but was quite sore afterwards Troyan made a noise at Ludlow and will need some attention to his wind, and Presenting Paddys’ brain was going a lot faster than his legs at Southwell after two years off the track, when tipping up at the second. He had a lovely school around after though and won the race – sadly without Charlie!! A few changes to the team recently and a big welcome to Kate Pheasant who has joined us this week and also Jordan McCall who has arrived from The Northern Racing College – never an easy thing to join in the middle of a season, but I am sure they will both settle in quickly with the rest of the troops. Its also frustrating when people choose to leave in the middle of a season – especially those who have been given plenty of opportunities on the riding front – but life goes on and sometimes change is for the best. Charlie in as usual to ride out, joined by a couple of new faces in Fran & Liam who are in most days, Gerald Tumelty is here once a week too – all a big help to the regular crew, and all have plenty to give on the general entertainment front! Joe had a good winner at Carlisle the other day, which had AP been on would have made headlines! Miles out of it at the last Joe managed to conjure up a miracle run out of Madam Lillibet to get up on the line! Great effort. Entries at Cheltenham done for Thomas Crapper & Garrahalish – exciting times!! Entries this week include Under the Phone at Ludlow, The Lion Man, and Wildmore Boy at Newbury. Well after a bit of a winner drought and an outbreak of ‘placeditis’ it was great to have a winner at Kempton on Friday. Four runners meant a busy day for the team, and a two lorry trip, which turned into a story on its own! Under the Phone and Thomas Crapper on the first box, with Holly and me – Kelly and Harriet with the two bumper horses leaving later. An uneventful trip with the first two, but the peace shattered as we arrived at the races to a call from the other box to say that they has had a blow out on the motorway! An immediate turn around for me, abandoning Holly with the boys! A few phone calls resulted in a friend dropping everything and going to their assistance with a replacement lorry – a complete motorway closure of the M40 as they swapped lorries, a meeting at Oxford services to swap again onto my lorry and a dash back to the races, leaving Harriet to wait for the breakdown guys to finally appear with a new tyre! As always great teamwork, and huge thank you to Roy Hall who came to the rescue, getting to the girls faster than I could to get the horses off the motorway, the motorway police where also great and the team at Kempton just got on with it and had a winner whilst we were on the M25!! Gutted to miss the action, but managed to watch Under the Phone finish on Kelly’s phone whilst in a very slow bit. I think anyone near us must have thought they were next to a couple of lunatics jumping up and down and yelling our heads off, with three barking dogs also joining in! Thrilled for The Tricksters who have had a torrid time of late with losing their previous horse Ballyhooley Boy to colic last year. A good many of the group there to cheer UTP home and other members keeping up with the action from as far away as New York, Burma and India!! The emails afterwards made for some great reading! Also chuffed for Joe who rode a super race and was not fazed by taking on the champion jockey going to the last! In fact AP was so disgusted at being beaten by Joe that he announced his retirement the next day!! This winner reduced Joes' claim to 7lb – he is well worth it and deserves to get a lot more opportunities. Thomas Crapper was having a run before Cheltenham, and had a nice jump round and a gallop – track probably not suiting him too well – he prefers a hill in his way! The two bumper horses both disliking the sticky ground. Myroundorurs is a lovely, good moving baby chaser, he pulled far too hard for his own good, and will want better ground and has to learn to settle. Our first runner for Andrew and Jane Nicholls, who we are delighted to be training for, welcome to them and we hope to have lots of success for them. The Lion Man ran well for a first run, he is a replacement horse for John and Margaret Cooper who own Dancing Daffodil with us. DD is off to stud, so ‘Roary’ (I know it’s a good one !!) has some big hoof prints to fill! Thankfully no drama on the way home, and to The Blue Boar for a celebration steak when we got home. Everyone far too tired to cook, and as usual the pub very accommodating regarding cooking late for us. Thoroughly recommended if you are in the area. Happily all the horses home safely and fine the next day. An absolutely frantic week – not enough hours – or days! Very quiet on the runners front as heavy ground and lots of unsuitable races, but lots else going on. Ireland on Tuesday for me to treat a lot of backs. Great fun to go to different yards, meet different riders – and all for £9.99 each way! Charlie over on Wednesday morning and it took him less time to fly from Birmingham than it took me to get from Monkstown (south Dublin) to the airport! Awful traffic, but got there in the end. A rapid drive to Wexford followed and a usual whirlwind tour, looking at some nice, and some not so nice horses. Charlie rode the ones we liked, and we drove a lot of miles! Screeched back into the airport just in time for some alcoholic sustenance before catching the ten o’clock flight back. Exhausting but fun! Cheltenham on Saturday for racing and the sales. Garrahalish hating the sticky dead ground and not really travelling like his usual self when another horse jumped into the back of him – knocked Gary sideways, and Charlie out of the side-door – game over, Gary had a nice school round the rest of the way and was none the worse for the outing. Nothing untoward showing up afterwards so we can only really put his slightly disappointing run down to the ground. My great team showing their colours on Saturday, with Holly giving up half of her afternoon off to come and collect Gary from the races. I took him in the big lorry, but had to get back for the sales, so she saved me having to go back and forth so many times. Appreciated. Kelly doing the airport run too as I could not take Harriet – they are great and are happy to help out with anything. We could not manage without them. We are currently looking for a new recruit to join us as our horse numbers are up, so if you can ride well and want to join a great team do give us a call. The sales are always exciting and we had a couple to find. Our priority was to find a horse for the Point of Attack Partnership who so sadly lost their namesake a few weeks ago. Several of the members in attendance to have a look before and after racing, and we eventually managed to secure Get Involved a smart horse by Milan out of a Strong Gale mare. Already a winner of a point in Ireland he is a hugely exciting recruit for a lovely partnership who deserve a bit of luck. Also a lovely Kayf Tara called Some Finish, who has been placed pointing and is for sale. Always great to have some new faces to make plans and dreams for, and particularly pleased with these two. Also nice to see so many of the Point of Attackers here on Sunday morning to wet their new baby’s head! A very good lunch with Gareth Conway, Lynne Tunnicliffe, Gerald and Sue Hart and Chris, Lou & Lucca Dickin (who thought they had come to a mad house for the weekend! )at the Blue Boar afterwards. Also delighted to welcome Andrew and Jane Nicholls to the team, they have taken over ownership of Myroundorurs, a five year old that Charlie & I bought before Christmas, who has been third in a point and who is working well at home. We wish them the best of luck with what looks like a very nice type. Also pleased that John & Margaret Cooper have bought a half share in The Lion Man to replace the irreplaceable Dancing Daffodil who is off to stud this time. Robert Cockerall & Hazel West here on Tuesday to see Get Involved (whom they loved), and Brett Cahill and team here to see Presenting Paddy today. Good effort from all because the wind has been fair howling up here this week and its pretty cold. The horses happy to stay in today rather than go out for a wallow! We are getting a really super bunch of horses up together now, and although the majority are relatively young, and will need some time before they are winning, it’s hugely exciting having so much young talent here. Equally pleased to have Anti Cool off the sick list and back with a saddle on this week. Megan sitting pretty tight a few times as the lovely ‘Andy’ showed us just how pleased he is to be out again! Young Lou also back on the move again and also pleased to have Rachel off the sick list after fracturing her wrist before Christmas. A busy week, but only a couple of runners. Anti Cool to the vets for a 12 week X-ray on his cannon bone, first thing on Monday morning. Good news on that front as it looks to be healing well and he can start walking again. After 12 weeks in his box he is pretty fresh, and pleased to be in action again, not sure that the team are so pleased at the thought of sitting tight! Bally Lagan also about to start into some light work after a good scan, so plenty of glue needed! It’s always gutting when horses get injured, and the weeks and months stretch out in front of you to wait for them to mend, but actually it goes surprisingly quickly and it’s also rewarding to see them back in work and feeling that we have done a good job with their rehab. Of course none of this is possible without their incredible, patient owners who listen to what is needed and give us a free rein to nurse their athletes back to full health. Nice to see Mrs and Mrs Bowcett here on Tuesday to see Anti Cool and Galactic Power. Gareth Conway and John O’Neill also here to chat through the aftermath of losing poor Point of Attack, and John and Margaret Cooper also here to make some plans as we have decided to retire the lovely Dancing Daffodil to stud. She has been a great fun horse for us, winning 5 races and being placed many times too. Now to decide who will be the lucky husband! Ludlow on Thursday was as wet as I have seen it – Routine Procedure improving hugely after a couple of disappointing runs – the addition of a tongue tie clearly having the desired effect, he travelled and jumped much better and finished a creditable sixth. RP is a stunning looking horse and although that does not guarantee him to be a star he is a baby chaser and any hurdle form will be a bonus. Wildmoor Boy went off favourite after his excellent Cheltenham run, and all looked to be going according to plan until they turned for home, when crossing the chase track he appeared to stop dead. Dropping to last it looked as if something was seriously amiss, but then ran on to finish fifth. Whether the softer ground caught him out for a few strides it’s hard to tell, but he is clearly still a lovely horse, possibly not suited by the sharper track. Happily both horses home fine, even after a bloody awful journey home in a howling gale, with bits of trees flying in all directions! Charlie and I are off to Ireland to look at a few on Wednesday – always a hectic day, involving a lot of driving and trying to find the next star! Entertaining too – watch this space for what we find! The crappest of crap days on Monday, with the loss of Point of Attack. A freak accident in his stable at evening stables left the team here reeling and his lovely owners in shock. Declared to run the next day, ‘George’ was in great shape both physically and mentally and had, what my Dad would have called ‘the lion look’. Sadly it was not to be and we lost him. We all accept the risks of dealing with and riding these wonderful creatures, and like most racing yards give them the best of everything, in terms of care, but also our love and attention. This was certainly true of PoA who arrived as a nervous and very thin horse, but who had blossomed into a confident athlete, with the care of our team, and the patience of the partnership who owned him. Our conditional jockey Joe had looked after him from day one, and been a huge part of the change in him. We had not seen the best of him by far. A quiet one for us spent with our neighbours so although some damage done to some bottles of fizz New years' morning dawned without the statutory headache – more than can be said for the youngest member of the household who saw the New Year in at a young farmer’s party – enough said!! Off to Cheltenham with Wildmoor Boy, who is the first foal of Simple Glory who ran so well for Cliff Beech & Brian Wilkinson a few years ago. Only small, he has been showing plenty at home but this was a very hot affair and we thought a mid div finish would be a great start. Immaculately behaved in all the preliminaries we could not believe our eyes as he came cruising down the hill and turned in in front! Despite our best efforts of encouragement from the floor he just got collared up the run in and finished a truly excellent third. Delighted for Cliff & Brian. Sadly Cliff not there in person as he has been unwell – but a near perfect tonic to cheer him up! What an exciting horse for the future – the family have two more half brothers to come as well so great encouragement for the breeding side for them! With Timon’s Tara also running so well its really exciting thinking of what we have to come for the future from our bumper horses – and a few still to run too! No runners over the weekend, Joe Palmowski has set off to Ayr for one ride today so a long drive for him! Next week looking reasonable busy so hope the weather will let us keep going after losing a couple of meetings this week. Frustrating to lose both Haydock and Warwick this week where we should have had runners – but very cold and frosty here although it has really warmed up this evening. Hopefully Cheltenham will be fine for tomorrow, when Wildmoor Boy makes his racecourse debut in a hot looking bumper. Sadly Cliff Beech under the weather with a bad cold so unable to come to see the first of his homebreds on the track. A quiet New Year for us – most of the troops off to a young farmers party so it’s a good job we are having a slightly later start in the morning! 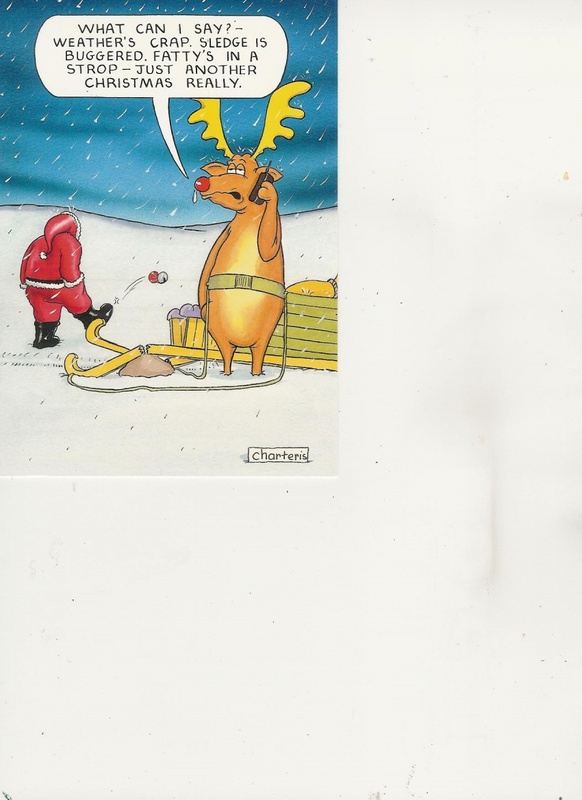 Well the festivities nearly over for another year – thank goodness! As usual Christmas seemed to come all in a rush – despite having 12 months warning I was really behind myself this year, and a frantic week before did not help! Dontminddboys showing huge improvement to finish sixth at Towcester – the handicapper having a bit of a laugh and giving a mark of 113 for his efforts – extremely harsh. Two days at Ascot resulted in two visits to the winner’s enclosure, but in the second spot – I know you should not be disappointed with second, and on so many levels we were not – BUT…..
Garrahalish running really well again to finish second, Thomas Crapper also his usual rock solid self – also second. Both to what are very good horses. Gary up four pounds for his efforts, TC down one. Under The Phone a shade disappointing, to finish eighth but Charlie reporting that he hated the tacky soft ground. He has really got his jumping together now though and will be back to himself on a better surface. Timon’s Tara running a blinder to finish sixth in the listed bumper – she is shaping up to be a really special filly – delighted with her. The long trek to Fakenham on a Sunday - a frustrating day as Charlie and Point Of Attack parted company on the final circuit – annoying as he was jumping really well – first time over fences, when one fell in front of him which I think distracted him momentarily, and he put in a short one, hit the fence and with Newton’s Law of action and reaction taking over, Charlie overtook George in mid air!! Happily both fine and lots to like about the run to that point. Four hours home in a big side wind was not to be enjoyed! A rather frustrating end to what has on the whole been a good year, sad to report that our star Restless Harry has picked up a stress fracture and will be out for a couple of months. He was lame after Cheltenham – worrying as Harry is rarely wrong – and a bone scan revealed the problem. It should be a straightforward healing process as no joint involvement but with plenty of mud about its gutting to have him on the sidelines – he will be back! Anti Cool is mending well after his set back and really looking forward to seeing him in action, Young Lou also off for a time after picking up an injury at Ludlow, again she will be fine but frustrating to miss a big chunk of the middle of the season. Wonderful patient owners in all cases – AC & YL being a very patient patients – the same cannot be said about Harry!! Rachel also on the sidelines after picking up a fractured wrist when getting squashed against a wall by a rather rude new horse who has yet to learn any manners. Toby’s sister Daisy stepping seamlessly into the breach and coming full time whilst Rachel mending – many thanks to Daisy – we may not let her go again as she has fitted in so well. Gutting to see Queen of The Stage going to the sales and then winning again a week later. No Haydock today and Warwick must be in doubt tomorrow – there would be no chance of racing here today, there is a heavy frost, although happily the gallop doing better than the track at Southwell, and business as usual on the exercise front, although some very cold fingers and toes. The team Christmas party was at the Blue Boar who looked after us very well – a few looking a bit steady the next day, and a slightly later start was a good plan on my part! Thank you for all the donations to the drinks fund which was all put to good use. Thank you also for all the goodies that arrived over the festive period! All much appreciated, although the office did resemble an off licence at one point! All of the team got to where they wanted to be for Christmas day which was great, but also meant that our Christmas was diverted from Stow on The Wold to here, and that the designated cook was me! We had a lovely day though – always great o have a bit of family time, especially as everyone seems to be so busy these days that it’s hard to find eth time for a catch up. Cheltenham on New years day with Wildmoor Boy having his first outing – a bonny horse out of the lovely Simple Glory who won several races for us. A really busy day at Ludlow on Wednesday with six runners! It should have been seven but one not quite satisfactory scope held the numbers down! Brian on duty with the first three and Kelly and Megan then the others with myself Holly & Harriet following on a bit later. The home team left with plenty to do as both Joe & Toby riding too – but a great team effort to get through a mad sort of day! The girls at the races doing a fantastic job and winning no less than four out of a possible five BTOs, and to be honest Holly was robbed in the bumper too. Possibly the judges thought we had had enough prizes, but Timon’s Tara was clearly the best turned out but the prize went elsewhere to a turn out that I had best not comment on!! Galactic Power (BTO for Kelly) looked fantastic in his EPDS green, was first up and then ran a blinder to finish a flying fourth – only ¾ length off the third – pleasing as he is improving with each run. Toby giving him a good ride. Joe rode Jackfield in the same race – a satisfactory run for first time over hurdles. Be My Witness (BTO for Megan) managed to eject Toby three out when looking held – both fine after the race. Kitegen (BTO for Holly) hated the dead ground and will now have a break and be ready for some better ground in the spring. Under The Phone (BTO for Holly) ran a super race and finished flying to be second under Joe. He hit a bit of a flat spot down the back, and then ran on really well up the straight. Great to see The Tricksters having some fun at last after all the frustrations that they have had over the last few seasons. UTP is a gem, and has a great character as well as having plenty of ability. Timon’s Tara following up her great first run again ran a really solid race, but hit traffic problems all the way, and ended up a rather frustrating fourth. She is shaping up into a serious filly who would have nearly won given a clear run. Frustrating not to have winner, but much to be taken from the day, and really proud of the team at getting everything done with smiles and good humour, both at the races and for Paige & Rachel who held the fort at home along with Harriet T and Georgia who came to help out. Thanks to them all. The journey to Ludlow does not improve and in a lorry is worse involving about a million gear changes – so very happy to come home to huge curry kindly cooked by my Mum, which fed everyone, safe to say the exhaustion had set in by then and everyone happy to collapse in a heap and chew the day over along with the curry! No runners over the weekend, and some winter eventing for a change tomorrow. Off to Towcester last Saturday with the gorgeous Garrahlaish – only a four horse race but a hot little affair and certainly not a walk in the park – or even a wade – with the ground very heavy after all the rain. Charlie went very wide to try and find some better ground, which seemed to be a good plan. Gary thought he could fly at the first and Charlie did well to keep the partnership together after being about 25 feet into the air!!! Nearly as high at the second which was a ditch, but then foot perfect after that! He is the most amazingly athletic horse and makes it all look very easy – really the result was not in doubt apart from a brief moment when the second horse appeared to rally half way up the run in, but think Gary was just getting a bit lonely in front and as soon as he saw the other horse pulled away again to win by two lengths. A very noisy reception from his enthusiastic and well named bunch of owners – Just 4 Fun! A second win at Towcester over fences for Gary, and a third in total as he won his first hurdle race there too. Delighted with Gary – the biggest grin was probably from Toby who looks after him. A valuable race for Towcester so a nice prize to have and lovely to have another winner for such an enthusiastic bunch. Plenty of tooting as we arrived home and lovely to see some of our neighbours in Park Lane clapping as we went past. Only Ludlow this week but with 7 runners, so a really busy day to look forward to on Wednesday. Christmas looming and trying to start to make some plans so that the troops all get to be where they want to be – no easy task with a yard full of horses! Runners a bit thin on the ground this week, but starting off well at Ludlow on Monday. Young Lou and Timon’s Tara both running well. YL made very heavy work of it in the early stages of the race, and testing Joe’s fitness level – which was not round to be lacking!! She tried to drop herself out up the straight first time but thanks to Joe’s perseverance ran on well to be a very decent third. Another stride would have been second, and another 100yds – who knows? Nice to see Cliff Beech’s colours back in the winner’s enclosure. We had had a very nice evening with Cliff, Brian and their family at Wolverhampton on Saturday night, at their annual dinner, so it was nice to follow it up with a good run from YL. Timon’s Tara (Billy the Filly to her friends!) has been a waiting game for VERY patient owner Mark James. She has taken a while to grow into herself and we roughed her off last Christmas when nearly ready to run as she just seemed too weak to do herself justice. Marks’ patience so very nearly paid off in the best possible way when TT ran a stormer to finish a gallant second in the bumper. Thought she would win at the furlong pole, but she just could not quite reel in the winner – despite the encouragement from in front of the TV back at home! Great effort from her and a good ride from Charlie – frustrating at the same time though!! Somewhat confusing weather this week – freezing cold and very icy yesterday – pouring rain and much milder today. It’s very hard to get the rugs right with the constant change in temperature as one minute thy need duvets and the next they are sweating! The team seem to be split on whether they prefer to be wet or cold! The dogs are as one in that they hate the rain!! Only entries at Towcester and Wolverhampton for the rest of the week - Garrahalish unlikely at Towcester after all this rain, Windy Miller may well go to Wolverhampton. A bout of ‘seconditis’ breaking out which is always frustrating! Thomas Crapper as always a model of consistency but getting mugged up the run in twice in two runs is enough to cause the use of some bad language! A great run at Warwick resulted in getting pipped by a fast finishing very decent horse of Paul Nicholls, and then another exemplary round at Leicester on Monday was frustrated again - I know you should not be disappointed with second, BUT……..! TC Fine after his excertions, in fact bucking and kicking around the field after wallowing in the mud on Tuesday morning!! Other recent runners have been Kitegen and Dontminddboys at Warwick – the usually consistent Kite running no sort of race, and knowing him so well Charlie pulled up to save him for another day. Reason found after, which was a relief. DMDB made a bad error, frightened himself and it was game over for him. Point of Attack and Galactic Power ran at Southwell in a very hot novice hurdle. Toby was unshipped at the first (whoops!) but PoA ran Ok, Struggled around the home turn for a short distance but then ran on – now handicapped with an extremely harsh 99! Five runners last Thursday with four to Ludlow and Be My Witness at Taunton. Megan and I arrived at Taunton in a storm that could have announced the end of the world! Howling gale and deluge turned the ground to very soft, which would not suit her. However, she ran a really gutsy race to finish third – pleased with her. Brian took the gang to Ludlow, and their day started in excellent fashion with a really gutsy win for Queen of the Stage, very ably ridden by our claimer Joe Palmowski. Three upsides at the last ‘Dingle’ was nothing if not brave and won by a head! Sadly owner Nic Allen not there but plenty of supporters to cheer her home. Young Lou’s, first run for a while and she got a bit tired turning in, but then ran on well to be fifth, and the two bumper horses Jackfield, and Routine Procedure both got a bit stuck in the ploughed field that was the straight by the time the last race came round! Everyone home safely though which is always a relief. Queen of the Stage is for sale – preferably to stay in the yard – so do call if you might be interested. Under The Phone and Restless Harry to Cheltenham on Saturday. UTP ran a really solid race to finish running on. He is shaping up into a lovely horse, will want further, but has a great temperament and plenty of ability, and will hopefully be lots of fun for The Tricksters. Restless Harry struggled on the second circuit and did not seem himself at all – he has come home a bit sore so plenty of tests to be done. Back to Warwick yesterday with Dans Quest, Dontminddboys and Galactic Power all having educational runs – all improved on their previous outings, so happy with them and all fine today. Excitement yesterday as the results of Charlie & my trip to Ireland a couple of weeks ago arrived yesterday morning, in the form of three Irish pointers! Myroundorurs (By Arakan out of an Anshan mare) a really lovely type who has been third to a decent horse who mad £35k in Brightwells sale last week. The Lion Man, (by Let The Lion Roar ex an Anshan mare) who has been fourth behind two horses that have now won their bumpers over here, and Darsi Pass who has gone to Francesca Nimmo to go pointing over here. Delighted with our two and after watching the sale last Friday they both look very good value. Pictures shortly – it’s so gloomy here today not sure they would show up on one today! Plenty of improvement do-able from both once we get them looking stronger. Both for sale so do get in touch and come and see them in the flesh! A nice day at Ascot on Saturday. Garrahalish running a blinder in the novice chase, in which the winner broke the track record! Gary again jumping very well, just getting a bit tapped for toe from turning in. He will want further in time, but at only six still he is a very exciting horse. Plenty of his happy – and well named – owners there to support him, and to have a good day out. Just4Fun are all in it for the right reasons and hopefully had a great day out. Restless Harry ran very well in top class company, but found the ground just too quick for him. He has really got his jumping together now and just needs it to rain and rain! Richard & Lenny there to watch. Apologies to Lenny who I left out of the Open Day catalogue! Both horses won the BTO, Toby & Holly both doing a fantastic job, and both standing out from the crowd in the paddock. Very decent prize money for the BTO’s so well worth winning. Thank you Ascot! Personally think that there should be one in every race. It would not take much effort from the tracks, and would be appreciated by the lads & girls. Ascot also coming up trumps in the stable staff canteen this time. It is somewhere that has caused plenty of moans in the past, but free (and very good) food all day was very much appreciated by all. Both horses fine after their excertions, field time curtailed a bit yesterday with very heavy rain keeping everyone indoors. Nice to have a day at home before a very busy week this week. Charlie & I are off to Ireland tomorrow to look at some horses, Charlie then back for Warwick on Wednesday, whilst I am staying to do a day of ‘backs’. Absolutely gutted to be missing Warwick where Thomas Crapper, Kitegen & Dontminddboys all run, but over once a month now to work, and with the flights at £10 when I booked were too good to miss. Will just have to make sure I know where the nearest bookie (or pub with a telly) is at the relevant times!